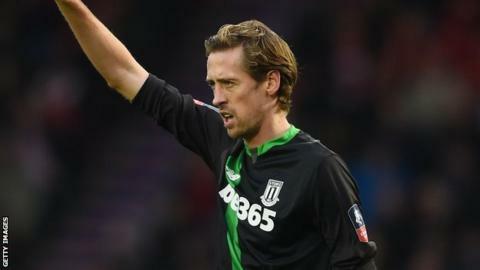 Stoke City striker Peter Crouch says he is not looking to leave the Premier League club in search of more first-team football. The 34-year-old, who has made only three substitute appearances in the top flight so far this season, started and scored in Stoke's 2-1 FA Cup third-round win at Doncaster on Saturday. "I love it here, it's the best squad since I've been here," Crouch said. "It's been improving year in, year out, and I'd like to be a part of that." Stoke, who will try and overturn a 1-0 deficit in the second leg of their League Cup semi-final against Liverpool, at Anfield on 26 January, are 10th in the Premier League, four points off a potential European place. Crouch has not started a Premier League game since Stoke's 2-1 home defeat by Crystal Palace on 21 March last year. Although the former Liverpool, Portsmouth and Tottenham striker is keen to stay at the Britannia Stadium, he concedes that he will have to reassess the situation if the club accept any offers for him. "If that's the case then, obviously, I'll have to look at other options," he told BBC Radio Stoke. "It's more than frustrating when you're training and not playing. You can get very down about it. "All I can do when I get minutes is try and produce."